I often get asked when the best time to exercise is for optimum fat loss. The fact is, the number one reason many people don’t exercise is due to lack of time, so the best time to fit in exercise is when you can fit it into your busy schedule. There are no conclusive studies to suggest one time is better than another for fat loss or performance because everyone is different. One person is energized in the morning while another is energized at night. The BEST time for YOU to train is when you have the most energy and when you can fit it into your lifestyle. 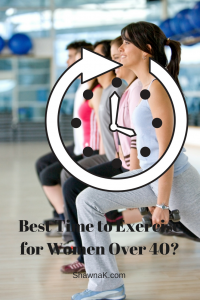 Studies do show that a REGULAR exercise time will yield the best results, especially for those new to exercise. When you pencil in your workout on the regular, you’re more likely to stick to your routine and it will become part of your healthy lifestyle. If you’re a night owl, exercising at night is not a bad idea, unless it interferes with your sleep. Exercising too close to bedtime may make it difficult to wind down and sleep. Whatever you decide is right for you, consistency is the key to health and improved body composition (fat loss). If you’d like more personalized help, I’m here for you! Fill in this questionnaire and let’s get a conversation going. We’ll trouble shoot what’s going on for you and find easy solutions to upgrade your health.